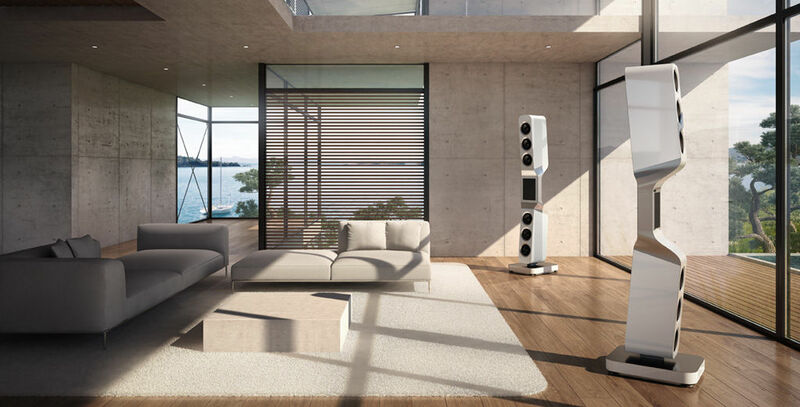 The flagship product Epoque Aeon Reference sets the ultimate benchmark for loudspeakers. The core of our flagship Epoque Aeon Reference represents the “Carbon Excellence Aeon“ bending wave driver that is based on the patented bending wave technology by Göbel®. This “Carbon Excellence Aeon“ bending wave driver is based on the principals of sound creation through musical instruments and is the result of over 15 years of development that we invested in order to achieve the most natural sound possible. In order to also achieve an absolute homogeneous sound dispersion and stimulation of the room modes within the low frequency range the Epoque Reference is additionally equipped with 12 custom built Göbel® Aeon 7 inch long throw aluminum bass drivers. These symmetrically arranged bass drivers are specifically located on the front and the back and are impulse compensated to create an absolute smooth transition of the „Carbon Excellence“ Aeon bending wave driver`s broad frequency range to the low frequencies of the custom built bass drivers. The purely functional design with the perfectly defined form and the use of specific aluminum alloys together with our special high density, bulletproof, multilayered composite materials eliminate any diffractions, resonances and energy saving effects.